Australian Stephanie Gilmore, 26, claimed her 6th world surfing crown in a dramatic finale to the 2014 Samsung Galaxy ASP Women’s World Championship Tour in Hawaii yesterday when Carissa Moore (HAW) defeated Tyler Wright (AUS), Gilmore’s closest rival for the title, in the Final of the season-endingTarget Maui Pro presented by Schick Hydro Silk at Honolua Bay. South Africa’s Bianca Buitendag played her part in title race, defeating Sally Fitzgibbons (AUS) in their Quarterfinal clash and denying the Australian’s World Title ambitions. Buitendag went on to finish third overall in the season ending event, her second best result of the campaign after her runner-up berth at the season opener in Australia back in March. Competing in excellent 1.5 metre waves at the fabled Honolua Bay on Maui, Moore snatched her third event victory of the year as she and Wright went blow-for-blow in the Final match. Moore nailed the coffin shut on her final ride with a 9.73 (out of a possible 10) leaving Wright needing a 9.31 for a victory that would have resulted in an historic surf-off with Gilmore for the ASP crown. Gilmore, Wright and Fitzgibbons were the three surfers in contention for the World Title heading into the final event of the year at Honolua Bay, a venue that Gilmore dominated when it was previously on the women’s schedule, posting victories in 2007, 2008 and 2009. Gilmore fell in the Quarterfinals to Californian Courtney Conlogue (USA), leaving to the door open to the remaining contenders. But Fitzgibbons was ousted from the event by Buitendag in the very next heat, dashing her hopes for a maiden world surfing crown and leaving only Wright remaining in the hunt against Gilmore. Wright, needing to win the event to send the title race to a three-heat surf-off, proceeded to smash her Quarterfinal against Lakey Petersen (USA) and Semifinal against Buitendag to reach the Final, but came up short and had to settle for the runner-up berth for the event and World Title. The final stop on the 2014 Samsung Galaxy ASP World Championship Tour will be the Billabong Pipe Masters in Memory of Andy Irons, featuring the men’s world title race between Gabriel Medina (BRA), Mick Fanning (AUS) and Kelly Slater (USA), from December 8 – 20, 2014. 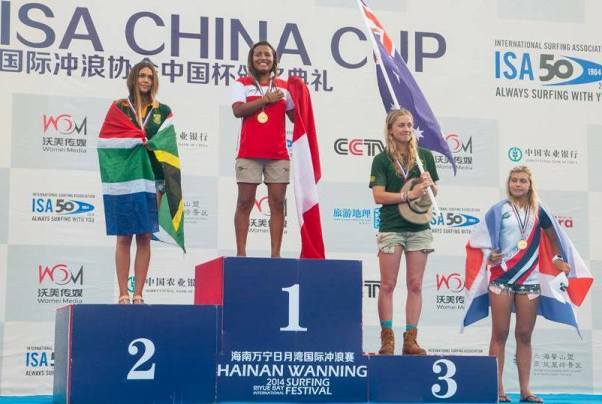 Tanika Hoffman clinched a memorable Silver medal for placing second in the Women’s division as the South African Surfing team finished fourth in the ISA China Cup at Riyue Bay in Wanning, on Hainan Island in the South China Sea earlier today. The invitational event, which featured the top seven ISA surfing nations plus a team from hosts China for the first time, ended in small thigh to waist high waves and rainy conditions on Monday. Hoffman, one of the country’s most experienced female surfing competitors, earned a well deserved first medal in her sixth appearance in national team colours. She marched undefeated directly from Round 1 into the Grand Final in China and led the decider for the first 20 minutes, but struggled to find a high-scoring backup wave and slipped to second place behind Milushka Tello (Peru) in the dying moments of the encounter. In the Men’s division, Michael February was the best SA performer. The Kommetjie resident reached Round 3 of the Qualifying stream before being relegated to the Repercharge rounds. There he survived one further round before being ousted in 7th position overall. Faye Zoetmulder was the next best South African, placing equal 9th in the Women’s division. Casey Grant finished his campaign in equal 15th place, Dylan Lightfoot was equal 17th and David Brand ended equal 21st. With strong performances on both the Men and Women’s side, Peru won the Team Gold medal and the ISA China Cup Team Trophy. Australia placed a close second, earning the Silver medal, Brazil won the Bronze medal and South Africa took the Copper medal. 1- Peru- 13,378 – Gold medal + ISA China Cup Team Trophy. Surfing South Africa (SSA) is recognized by the South African Sports Confederation and Olympic Committee as the governing body for surf riding in South Africa. SSA is made up of surfers, longboarders, bodyboarders and Stand Up Paddlers and is a member of the International Surfing Association (ISA), the World governing body for surf riding. Wanning, Hainan Island, China, November 23, 2014 –Michael February and Tanika Hoffman flew the flag for the South African surfing team when both advanced through two rounds of competition on the opening day of the ISA China Cup taking place in Wanning, on Hainan Island in the South China Sea. The event features eight invited national teams with Argentina, Australia, Brazil, China, Costa Rica, Panama, Peru and South Africa joined by a team from China, who are participating in an ISA surfing event for the first time. Competing is well shaped one metre waves that became smaller as the day wore on, all six South Africans team members finished first or second in their respective opening heats to progress to Round 2 of the Qualifying stream in the double elimination format used at ISA events. As the swell faded David Brand (Kommetjie), Casey Grant (Scottburgh) and Dylan Lightfoot (Jeffreys Bay) in the Men’s division and Faye Zoetmulder (Seal Point) in the Women struggled to find waves that offered scoring potential and were relegated to the taxing Repercharge rounds when they placed outside of the top the two positions in their Round 2 heats. February posted a convincing heat victory in Round 1 before holding onto second place in Round 2. The 21 year-old from Kommetjie, who was SA’s top male performer at the ISA World Surfing Games in Peru last month, will face three Peruvians in his Round 3 encounter when the contest resumes on Monday. Hoffman, who like February was the top SA performer in her division in Peru, also won her first match-up and placed second in Round 2 in China. The Hout Bay based 22 year-old comes up against surfers from Australia, Costa Rica and Peru in Round 3, with the top two progressing directly to the Grand Final and guaranteed a gold, silver, bronze or copper medal. 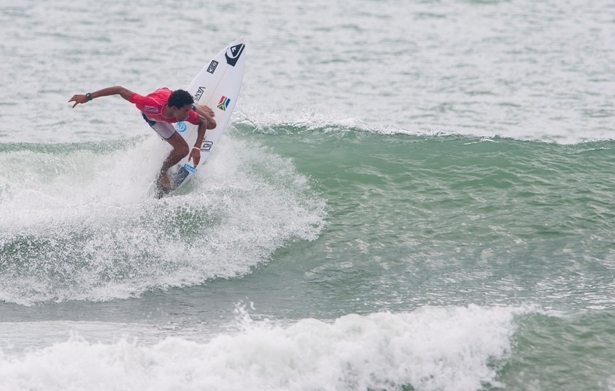 South Africa, Australia, Peru, Brazil, and Costa Rica still have all of their athletes in contention and are in the hunt for the Team Gold Medal and the 2014 ISA China Cup. Argentina is sitting in 6th place in the provisional standings while Panama is in 7th and unfortunately for the local Chinese team, despite a solid effort, they have lost all of their athletes and will finish in 8th place. Official Forecaster, Surfline, has predicted that Monday will feature small to fun-size ENE wind-swell with slight reinforcements early, then easing throughout the day. Inconsistent surf, mainly knee to waist high with occasional stomach high sets around favorable tides. NE winds are light to moderate (5-13kt) in the morning, trending ENE through the afternoon. All the action at the Hainan Wanning Riyue Bay International Surfing Festival can be found at http://hainaninternationalsurfingfestival.com/china-cup Live coverage starts at 1.40am (SA time) with The Morning Show hosted by Mike Latronic, who will be joined by Team China.. 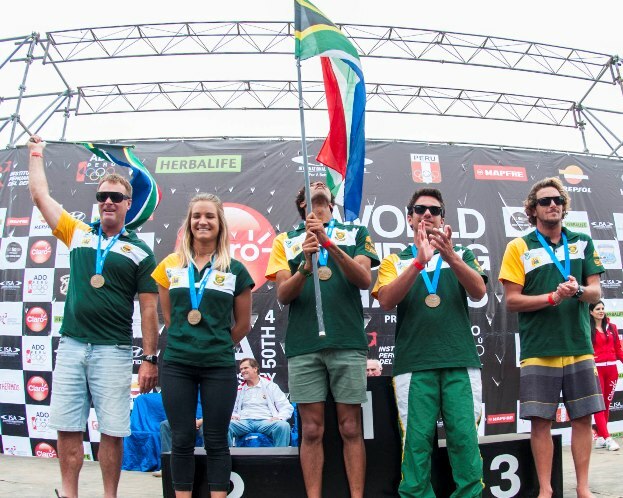 The South African Surfing team ended in sixth place out of the 22 nations at the historic Claro ISA 50th Anniversary World Surfing Games at Punta Rocas in Peru on Saturday as the hosts clinched the coveted ISA World Team Champions title in their home waters. South Africa did bag one medal at the event, the bronze for third place in the ISA Aloha Cup tag team relay event, and also ensured that the country stayed amongst the top seven nations who are invited to compete in the annual ISA China Cup, a National Team competition in on Hainan Island in China, and to contest the ISA Aloha Cup at the next World Surfing Games. Michael February, Casey Grant, David Brand and Faye Zoetmulder, the quartet who represented SA in the Aloha Cup on the final day, secured a berth in the Final when they claimed the runner-up spot behind Argentina in the semifinals on Friday. But the SA squad was relegated to third place behind gold medalists Peru and runners-up Argentina from start to finish of the 60 minute final on Saturday, with Australia awarded the Copper medal for fourth place even though they did not field a team in the final. The 2014 ISA Women’s title went to an ecstatic Anali Gomez who posted a heat total of 12.86 to win the Gold medal. Ecuador’s Dominic Barona (12.53) took the Silver medal followed by Australians Philippa Anderson (12.50) with the Bronze and Jessica Grimwood (11.63) with the Copper. Leandro Usuna (ARG) dominated the Men’s Final, earning impressive scores of 8.90 and 9.63 out of 10, the highest of the heat, for a total heat of 18.53 and a deserved Gold medal. Costa Rica’s Anthony Fillingim (13.57) clinched the Silver medal ahead of Australians Shane Holmes (12.84) and Nicholas Squires (12.70) who took home the Bronze and Copper medals respectively. Peru overtook Australia in the standings in the last heat of the event to record the narrowest winning margin in the history of the team event. The host nation finished just 62 points ahead when Anali Gomez won the Women’s title and none of the four Australians in the two Finals could finish higher than third place. Argentina grabbed a historic third place overall largely as a result of Usuna’s victory in the Men’s division while Costa Rica finished a fairytale fourth when Fillingim’s runner-up spot earned a massive 3 440 points towards their team total. Ecuador just held onto 5th spot, 62 points in front of South Africa, thanks to Dominic Barona’s runner-up spot in the Women’s division where the Ecuadorian finished just three / one hundredths (0.03) better off than Australia’s Philippa Anderson. 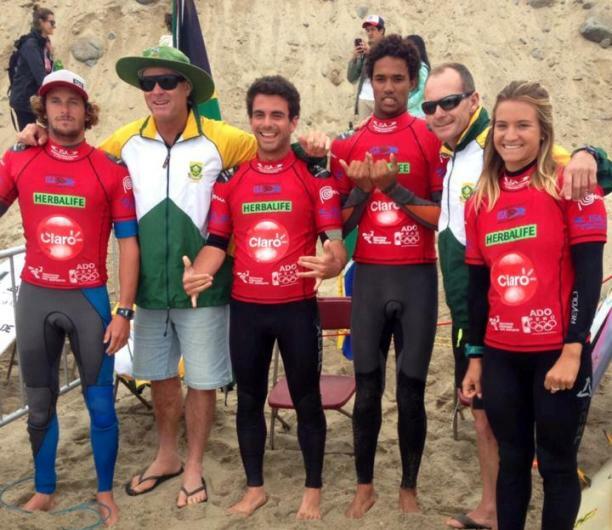 The 2014 South African Surfing Team competed in Peru thanks to assistance from the Department of Sport and Recreation. The South African Surfing team will be competing for a gold, silver, bronze or copper medal in the Aloha Cup event on the final day of competition at the Claro ISA 50th Anniversary World Surfing Games in Peru today (Saturday). Despite being knocked out of contention for individual and team medals earlier on Friday, the SA squad demonstrated teamwork, commitment and skill to qualify for the final of the tag-team relay competition where they will be up against Peru, Argentina and Australia. Team captain Michael February, Casey Grant, David Brand and Faye Zoetmulder represented SA in the Aloha Cup and accumulated a respectable 38.24 points during the allotted period to finish runners-up to Argentina and ahead of Costa Rica and Ecuador. February surfed last and saved a five point penalty that would have dropped SA down to fourth spot by getting back to the team ‘box’ on the beach just before the siren sounded to end the heat. The second semi saw hosts Peru finish ahead of Australia, Chile and Mexico. Earlier in the day February’s run in the Men’s division came to an end in Repercharge Round 8 where he placed third and was eliminated in equal 9th place overall and contributing 2 000 points towards the team total. Tanika Hoffman’s excellent campaign in Peru saw her open her account with an excellent 8.17 for a long ride on an overhead wave in Women’s Repercharge Round 4. The Capetonian backed that up with a 5.17 and advanced to Round 5, but struggled to find waves with scoring potential in the next heat and bowed out in fourth spot. Hoffman placed 8th overall in the Women’s division and added a haul of 1 056 points to SA’s team total. Australia has moved to the top of the provisional team rankings going into today’s final day of competition. Host nation Peru is in second place with Argentina and Costa Rica currently filling the last two team medal positions. South Africa, currently in sixth place and with no competitors still incontention, could still end up fifth out of the 22 nations at the event if Ecuador’s Dominic Barona finishes lower than second in the Women’s division final. Today’s action in Peru gets underway at 4pm SA time.